Rapid changes in intracellular calcium concentration ([Ca2+]i) are characteristic of Ca2+ signalling. 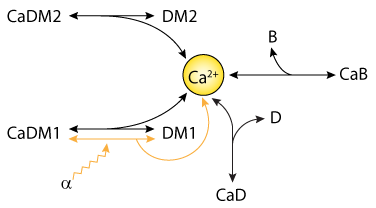 Following a stimulus, Ca2+ flows into the cytoplasm through channels in the cell membrane, and it's released from intracellular stores such as the endoplasmic reticulum. Normal [Ca2+] is resumed by the actions of Ca2+ pumps, exchangers, binding proteins (CBPs) and other buffers. Calbindin-D28k is a CBP which is present at high cytosolic concentrations in neurons such as cerebellar Purkinje cells and hippocampal granule cells. Together with its high cytosolic concentration, the ability of calbindin-D28k to bind up to four Ca2+ ions at any one time suggests that it plays an important role in Ca2+ buffering. Little is known about the Ca2+ binding kinetics of calbindin-D28k, or of CBPs in general. In their 2000 paper, Nagerl et al. describe a new method to measure the binding kinetics of calbindin-D28k, which involves flash photolysis of DM-nitrophen (DM-n), a caged Ca2+ compound. A mathematical model, which included the Ca2+ binding reactions of all the species in the solution (see the figure below), was fitted to the experimental data in order to determine realistic kinetic parameters. The results of their experiments suggested that calbindin-D28k has two kinetically distinct types of Ca2+ binding sites, one high- and one low-affinity. This heterogeneity was captured by their mathematical model. The raw CellML descriptions of the model can be downloaded in various formats as described in . Schematic diagram of the mathematical model used to simulate the dynamic redistribution of Ca2+ generated by flash photolysis of DM-n. CaDM1, CaDM2, CaD and CaB represent the concentration of Ca2+ bound to DM-n, dye and buffer, respectively. Alpha models the fraction of Ca2+-bound DM-n1 that is photolysed by the UV laser flash. Derived from workspace Nagerl, Novo, Mody, Vergara, 2000 at changeset 05fdb97bfb80.